There are two aspects to this review. The first is regarding the premium subscription experience with WWGOA itself and the second is specific to the “How to build a stylish stool” plan (which requires premium membership). First, if you Google WWGOA to find out more about it you will extensive references to a business practice it had a few years ago of buying names and addresses from woodworking supply companies and then sending unsolicited DVD’s and then sending invoices asking for payment or return of the DVD (but in a non postage pre-paid envelope). From what I can tell they then evolved their business model into the current WWGAO website with two-tier levels of free and premium content. The WWGAO is one of several similar websites run by TN Marketing. One of their current business practices with their websites including WWGOA is to do videos that purport to be instructional videos but in fact are nothing more than paid product promotions. So that free video on uses of a drum sander is in fact a paid 4 minute commercial for a Brand X drum sander. To me this is deceptive as the videos do not contain a disclaimer that the video was funded by the manufacturer being demonstrated. Visiting the WWGOA website is currently an exercise in frustration as it is very slow. Most pages take 10+ seconds to load. Whatever the root cause, it comes down to they are unwilling to invest in sufficient server or bandwidth capacity to give a better user experience. This is one site that is all about the money. I initially signed up as a premium member about a year and half ago and after a few months cancelled my membership because at the time I found I wasn’t using it. A couple of weeks ago, without any consent on my part, my membership was re-activated and my credit card dinged for another month’s membership fee. While I found this irritating I first sent an email to their account department requesting a refund but this went unanswered after several days. Thus I called their ‘customer service’ number which just goes to a call centre and they ‘cancelled’ my membership but dodged my questions about what happened. As it was obviously a call centre I didn’t push the matter. They also didn’t refund my money (again, the person at the call centre dodged that request) so I had the remaining 3 weeks left of my $5.00 paid month. Given the amount was $5.00 it literally wasn’t worth my time to call my CC company and dispute the charge. On a side note, this experience has led me to personally stop using CC’s for these types of subscriptions. Paypal is much better because the subscription is a visible recurring payment within Paypal and when you go in and cancel it – it is truly cancelled. Also, I find disputing a charge much easier with Paypal and I find Paypal has a much lower tolerance for vendors that pull these kinds of stunts / mistakes / frauds. A few issues with invalid transactions and Paypal cancels the vendor account. Anyway, given I had the remaining membership I came across the “How to build a stylish stool” video. This is a beginner level project but I liked the resulting stools and I needed a couple so I decided to build one. The first thing I noticed was that the link to the “PDF for this project” was broken. There is a comment section so I posted a request for the broken link to be fixed. After a couple of days my comment was moderated away and the link not fixed. I then posted another comment asking again that the link be fixed and requested the comment not be moderated away. After a couple of days – nothing. So I added yet another comment that as paid, premium content that the link should be fixed. This time it was fixed, however with my comments moderated away. It turned out the “PDF for this project” was simple cutlist and to make matters worse it had mistakes (anyone else know of a board width to be 5/5”?). It did not have a diagram / picture of the project and its parts as you would expect in a plan. You can download and save the video but it costs money (Reg. $14.99, current sale $6.00) for this 33 minute video. Thus if you want to build this project after your premium membership has ended, all you have is a cutlist. This issue isn’t isolated to WWGOA – the videos in the premium section of the FWW website also use this business model. With the FWW video series, even the plans cost money. I greatly dislike this business model – to me if you are paying a monthly subscription for premium content you should at least get the plans (diagram and cutlist) as downloadable PDF’s as part of your subscription. On the other hand, the FWW premium membership does give access to lots of content that you can download and save as PDF’s and this includes plans that had been published in the magazine. As a video for a beginner project I found it lacking in several areas. 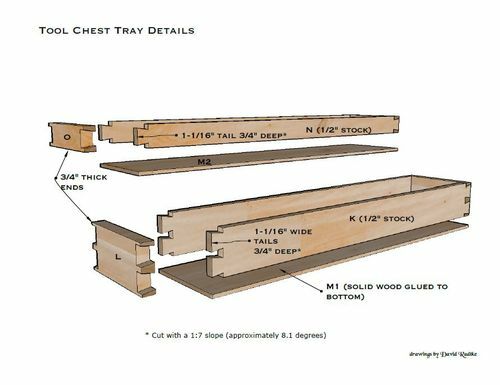 I understand that there are numerous preferences for video length and detail and there are a variety of ‘depth’ formats to be found in woodworking instruction. There are the short YouTube projects, there are the in-depth Wood Whisper Guild projects and there are the TV show 30 minute formats. On the side, I find the TV show format (common to Wood Works, New Yankee Workshop and Rough Cut) to be the most frustrating of all. The projects on these shows are too complex to show in 22 minutes and huge steps are left out or ignored. However WWGAO does basically TV Show style videos but without the excuse of having limited airtime. To me it is just produce the most content for the least money. One big disappointment with the video (and cutlist) is there are side stretchers on the stool with angled legs. This means the width of the tops of the stretchers are shorter than the bottoms. In both the video and cut list, the dimensions provided are for the shorter top dimensions. This is completely moronic as first of all you need roughly cut your stock and you’re left in the dark as to a suitable length. Second, when you actually make the cut on your mitre gauge, you need to set your stops based on the length of the long sides. Thus you are left either using trigonometry to calculate the length or you have to mark the short side and trial and error you way to cutting it and then measuring your long side. It would have been simple and logical to give the long side lengths. The other disappointments was the video used the Domino to attach the rails (I have no problem with that). However the rails are of course narrower than the legs and you need to offset the Domino fence when creating the mortises on the legs. This was mentioned in the video but the video left out the offset dimension to use or even calculate it. This is needed to build the project and would have been quite useful. The other thing is the Domino was used in the manner of cutting the mortises oversized instead the exact fit setting. You could see this being useful to get the top stretchers exactly even with the legs however this was never mentioned or discussed in the video. Some steps were left out of the video completely. When you see the completed stools, the tops have roundovers. However this wasn’t covered in either the video or cutlist. So it is a 1/4” roundover, a 1/2”? Who knows. The final disappointment came when the video completely skipped over the finishing process. Again I would expect a video aimed at beginners to give finishing a discussion. The video describes the pieces as being sprayed which is inconstent with the proejct being aimed at beginners who likely lack spray equipment. I chalk all the ommisions to the video being rushed in order to crank it out and get on with the next one. The video did have some good points. The presenter did discuss the challenge of clamping an angled workpiece and showed how angled cauls could be attached via double stick tape or hot melt glue. The video also did a good job of showing use of contrasting woods and different stool heights. The video also did a good job of cautioning not to rely on the cutlist to position the lower stretchers but to rather position based on your actual project which is very good advice. I only paid $10 for a year’s premium membership . I do not like the commercials, but that is the way most of the web based channels are. I did email them about why as a premium member we had to put up with the adds. Got no response. For $10/yr, I have found some useful videos, and some not so useful. These people as well as a few others have dubious marketing practices and there are many complaints written about them and above is just one of many listed. Word to the wise, stay away from them. Sounds like, “Woodworkers Guild of America,” just like so many online sources geared toward advertising over substance. Thanks for your review but sadly today E-commerce cannot survive on subscriptions alone. After reading information at their web site would think dealing with a professional outfit and ensure better customer service. Apparently not! If they hope to grow their business better listen to customer feedback and improve services provided. This outfit has been discussed here before. Isn’t this the series host ” George” the man Stumpy Nubs lampooned about having problems with his “stool”? Thanks for the critique. If we can make things better, we want to know how to do so. You’ve prompted some action on our end. I’ve checked with the web guy. We’ve recently done a site migration, and he admits that there’s currently a lag in load time on the WWGOA pages. He’s working on it. I’m no web developer, so don’t have a great explanation for it, but it has do with the the site’s code. Morse? Maybe. I’m not sure. But they’re aware. Billing. If you opt out of Premium membership, that should be the end of the road. The folks involved with this side of things are looking into what happened in this case. Sorry about the $5 overcharge. It shouldn’t happen. $5 or $50, it shouldn’t happen. Sponsored videos: Our form of advertising, in addition to standard web site banner ads, is sponsored videos. My goal with these is to provide a technique or some kind of tool education, while using the sponsor’s tool. During a sponsored clip it will always say “Tool X provided by mfr Z.” In addition to the sponsored clips, which are on the free part of the site, there are a bunch of non-sponsored free clips that also offer techniques and/or buying advice. We have about 500 of 4-6 minute clips on WWGOA (in addition to stuff ranging from 60-120 min), of which about 200 are free, of which about 35 were sponsored by a mfr. Deleted comments: We don’t delete comments we don’t like. But, see site migration above. We’ve migrated content a few times in recent years, moving to better and better platforms. I’ve noticed that some stories, aspects of stories, comments…don’t make the move. Nothing malicious about it. It’s computer stuff. (That’s my technical explanation.) Not quite seamless. We’ll notice that content is missing, but wouldn’t have a way to note that a comment didn’t make the move. , or what you see in this article http://www.wwgoa.com/article/shop-made-drill-press-table-plans/. We’re working through existing projects to add drawings, realizing there are gaps in what we originally provided. It’ll take a while to get to them all, since we continue to produce content that needs new drawings. Bottom line, we’re working to make each project a more complete package that will include all the necessary project details. Typos: I also don’t know what 5/5 wood is. Thanks for pointing it out. You’re the first one to bring it to my attention. We’ll correct. it. Short point vs long point: I’m sure that, in my head, I had a great reason for calling out short point to short point on the rails, but I can’t remember today why that was. Yep, with the miter gauge angled the way it is and the stop block where it is, long point would have been easier and made more sense. If we reshot this tomorrow…. Finishing: for most projects we end with “apply your favorite finish.” Finishing is so subjective. I spray lacquer (and am switching to water-based), others wipe on poly. Our approach is to provide finishing-specific content on its own, and let the builder decide what to use. These stools got another mention on this site here http://lumberjocks.com/projects/161154 and, yes, they are the object of the Stool Sample video. https://www.youtube.com/watch?v=pjwn0Qc5aF8 Yes, I know that I said stools something like 42 times. Wish we had the out take footage. It was hilarious. I’m about to leave town for a few days so if you post something following my post that you expect me to respond to, and I don’t, don’t get mad. Happily, I’ll be in an internet-free zone for a while, so anything I don’t see in the next few hours I won’t see till next week. I really enjoy teaching woodworking, and see the videos as a way to do that. We’re not out to just crank out minutes of edited content. We’re out to produce good content. Sometimes I screw up on a video, or in a cut list, or in a drawing. We try to catch this stuff in edit, but sometimes it gets past us. Thanks for the opportunity to talk this through. So you are a principle of WWGOA, I assume? Would be nice to have introduced yourself as such. Sorry, Paul. I missed that step. I’m the Managing Editor. Lots of people involved with WWGOA, like any publication. Thanks for commenting George and giving us a broader perspective. I hope the issues get dealt with and I’m glad to see the effort to include diagrams. If this type of feedback is new then perhaps WWGOA could add a feedback or survey feature to their website. Many organizations that are passionately concerned about their clients having the best possible experience do regular survey’s, often by encouraging participation with a small prize. Back when this outfit started up I received an unsolicited dvd. I didn’t return it. The law allows the receiver of unsolicited materials to dispose of or keep any without any payment. I’m sorry Mr. VonDriska is involved in this outfit. I lost much respect because of it. Back when this outfit started up I received an unsolicited dvd. I didn t return it. The law allows the receiver of unsolicited materials to dispose of or keep any without any payment. I m sorry Mr. VonDriska is involved in this outfit. I lost much respect because of it. Yup, one sleazy operation. After a while they sent what looked like a bill with the choices of returning the disc at your cost or paying for it. There is no recovering from such a first impression. 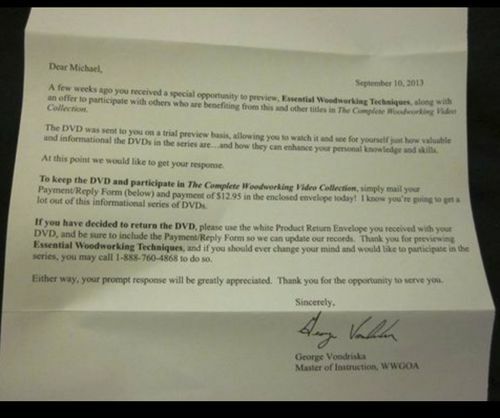 (1) Send $12.95 for the DVD and subscribe to “The Complete Woodworking Video Collection”. (2) Return the DVD in the Product Return Envelope that came with it. Who receives something unwanted and keeps both the item and the return envelope in case the sender asks for it back in a few weeks? I recant my “George Rocks” after seeing his name on the above document. Putting your name on it means something to me. Your recant has been duly recorded. Thanks for your review, Ottacat. I read about the letters and DVDs that WWGOA used to send out and that raised my suspicions of them. I signed up for their free e-mail newsletter and am constantly bombarded with e-mail promoting their membership. I’ve really considered it since it’s so cheap, but I’m now sold on NOT getting a membership. There are many other people/companies I’d rather support with my hard-earned money.